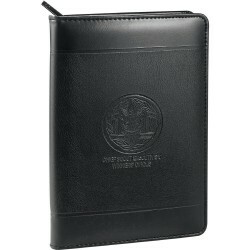 Promotional Non Leather Compendiums are great economical conference or business gifts. 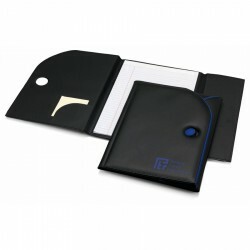 To save on budget without compromising brand image, go for Promotional Product Experts range of economical non leather corporate compendiums. They are made with leather-look koskin that adds a touch of class to the design. 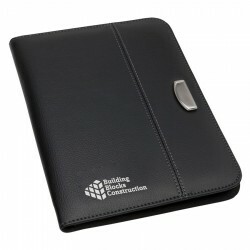 These branded compendiums come with a multitude of features including business card holders, notepads and calculators. 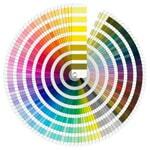 Available in A5 and A4 sizes and different styles including portfolio and two-fold designs. Double sided folio, soft koeskin, divider pocket, magnetic closure, multiple document sleeves, multiple pen loops, A4 lined notepad. Pen not included. 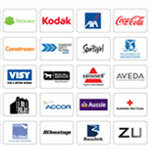 This economically-priced portfolio is ideal for those on the go. 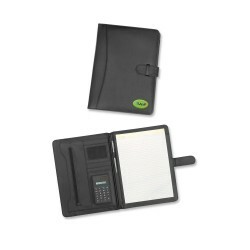 It features Soft leather-feel finish, Satin Silver accent plate, 8 digit solar calculator, Note Pad, Pen Loop and Business card pockets. Pen additional. P.U. portfolio complete with A4 lined pad and calculator. A4 portfolio manufactured in P.U. complete with lined pad (pen not included). P.U. 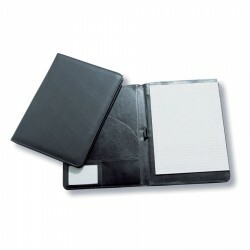 portfolio with calculator, A4 lined pad and closure flap (pen not included). Substantial P.U. 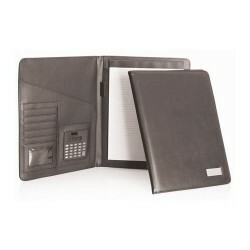 portfolio case with carry handle, A4 lined pad, calculator, ring binder and zip around closure (pen not included). Ice cream scoop with a unique trigger release. A4 two fold compendium, soft koeskin, document sleev, business card holder, pen loop, A4 lined notepad. Pen not included. Grained Leather-Look Koskin. Includes additional pocket on outside back and A4 pad. Optional dual powered calculator (D980) available. Black colour. In polybag. 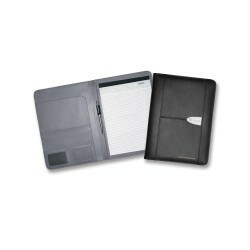 Smart black leather pad cover with A4 spiral notepad, pen holder, and pockets for business cards. 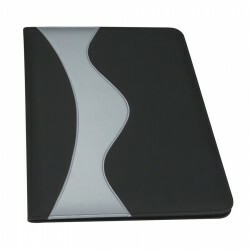 Black microfibre with PVC side strip, Coloured elastic fastening, coloured material inner, Lined A4 notepad, pen loops, business card pockets. Soft-touch Grained Leather-Look Koskin. Dark navy colour with matt silver metal badge. 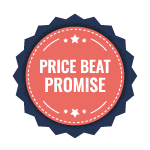 Includes A4 pad. Optional dual powered calculator (D980) available. In polybag. 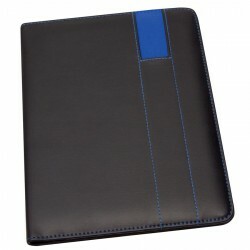 Black leather look pad cover with anodised black aluminium strip on cover, striped fabric lining, p pockets, and 30page sprial notepad. 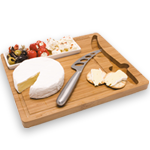 Supplied in black gift box. 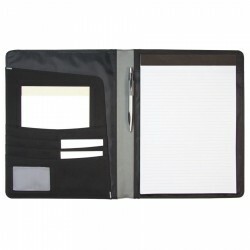 Black bonded leather, Silver badge A4 notepad, pen loop, multi us inside pocket, Includes black solar powered calcualtor, Check fabric design interior. Fabric made from 100% recycled material. 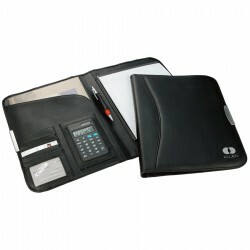 Zippered closure, interior organizer with gusseted pocket, velcro pocket, and five business card holders. Includes writing pad consisting of 100% post consume. 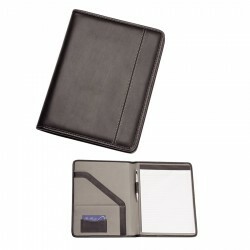 High quality Koskin, Fold over compendium, Document sleeve, Multiple card holders, Notepad and pen holder, Business card holder. 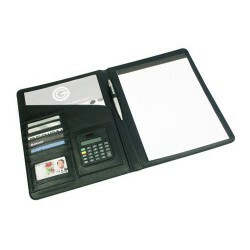 80GSM Non Woven Polypropylene, Fold over compendium, Document sleeve, Card holder, Notepad and pen holder, Business card holder. 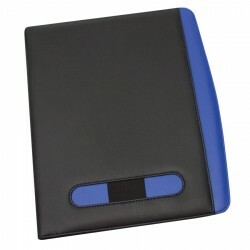 Handy pad cover made from PU imitation leather with mesh trim. 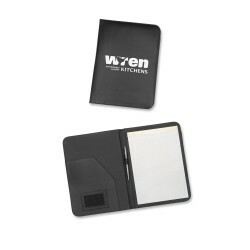 Features: Includes internal pocket, business card holder, pen loop and lined pad which inserts from the top. Pen not included. Available in 2 colours.